Yesterday I had lunch with Harold McGee. 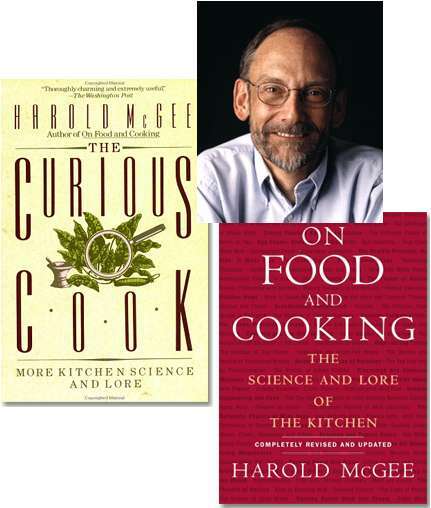 He is the author of the classic book on the chemistry of cooking, titled “On Food and Cooking”. Lunch was great — we ate with the head of Google’s many cafes, and with the chef, the Google doctor, the Google nutritionist, and some special guests. The conversation was about food, chemistry, writing, the ten years of writing and research that culminated in the book, the new second edition, book tours, book signings, abalone (the chef had prepared a special plate of delicacies), and teaching. I’m sure I left something out. Long after lunch, I was walking past a lounge area and heard my name shouted. Harold was sitting on a couch in conversation, having finished his tour of the Google campus, but apparently not yet ready to leave, even though it was approaching 3 in the afternoon. I joined him, and the talk turned to web sites. He has a very pretty website http://curiouscook.com, with biographical information and excerpts from the books, but not a huge pile of content. But he has collected a book’s worth of miscellaneous gems of knowledge about food and cooking that just didn’t fit into any nice categories. Besides, On Food and Cooking was already 896 pages long. The answer, of course, was to publish this information on the web site, where it will be a magnet for visitors interested in cooking, chemistry, food, and how they all fit together. We discussed some ways to organize and present it, and to get the work into the right form. We talked for over an hour, and I was almost late for my next meeting. So, keep an eye on his web site — there is likely to be a flood of fascinating new information coming soon.